This book is utterly un-put-down-able. I read it straight through in one sitting. 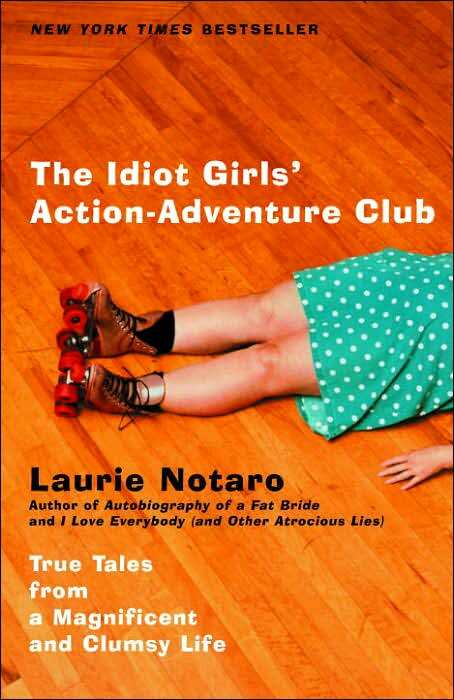 It is a collection of stories from Laurie Notaro’s crazy life. And the best part? It’s all true. When reading this book, it is impossible to not fall in love with Laurie. With nothing held back, Notaro brings us her life in all it’s rebellious clumsy glory. If you have ever been embarrassed, if you have ever walked the edge for fun, if you have ever been able to count your coins on one hand, then you will relate to her stories. So gather all your girlfriends and have a wondrous time Idiot Girls style and don’t worry if you don’t remember all of it the next day – that just adds to the fun. I remember us looking at that book one day in B&N. Glad to hear it’s as good as it looks! I MUST read it! Sounds like our gang! mos def! I think we need our own chapter of this club, with roller skating included as a necessity. I’m glad to get a review on this from someone whose opinion in books I trust. My mom bought and read it years ago, but I never gave it a shot. Definitely will now! Thanks! i’m glad to hear someone trusts my opinion! Joking aside, I’d def recommend it. I think you’d really like it.